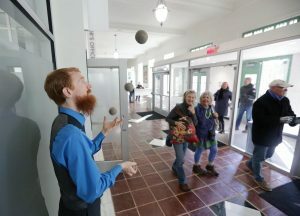 Madison Area Jugglers. Way to go, Nick! Lindsay Christians captures MCS at Makeshift. Read more here. Isabel Lawrence from NCS15 captured our groundbreaking celebration nicely! See the story here. 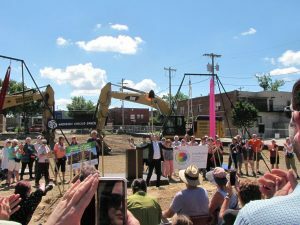 Join in celebrating the groundbreaking of the world’s only development of a circus training center, mixed-income housing, and artist cooperative site on July 18, 11am-12pm at 2100 Winnebago St. 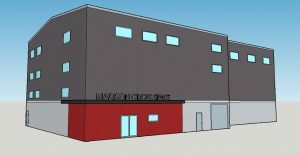 The Madison Circus Space, CohoMadison, and Accipiter Properties will be joined by Mayor Soglin and key supporters to break ground. Emceed by Josh Casey, this event will also feature talent by circus artists. Demolition of the site, including former tenants Winnebago Studios, Madison Circus Space, and Sector67, began on June 18th. 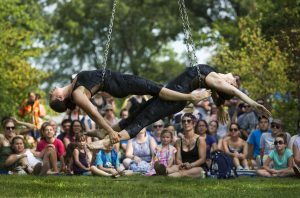 The Madison Circus Space launched a $1 million capital campaign to build a permanent home for circus and movement arts in early 2017. To date, the organization has raised $605,000. Artists from Winnebago Studios plan to form an artists’ cooperative to ensure affordability of studios. Madison Circus Space (MCS) is home to the largest community of practicing circus artists in Wisconsin. For the past five years, MCS, a 501(c)(3) nonprofit, has hosted classes, clubs, and performances that are affordable and open to the public. MCS provides the building and equipment necessary for safely learning circus arts and give participants a positive environment to support one another and to grow stronger physically, emotionally, and professionally. CohoMadison is a new cohousing community on Madison’s near east side at 2048 Winnebago Street. This 45-unit building will have market-rate and below-market-rate units, nine studios for working artists, and common areas, and will be legally structured as a condominium project. Interest in the project has been strong, with 36 of the 45 residential units reserved prior to breaking ground. This project reflects many years of work by people committed to creating a cohousing community on the near east side and who share a deep commitment to mixed-income housing as well as a desire to preserve spaces for artists displaced by development. Accipiter Properties is committed to providing permanently affordable space for working artists in the Schenk-Atwood neighborhood. Therefore, as part of the redevelopment, Accipiter included nine artist studio spaces as part of the CohoMadison project. Accipiter plans to collaborate with artists from Winnebago Studios to establish an artists’ cooperative to lease — and eventually purchase — the artist studio spaces. Additionally, Accipiter plans to fundraise to make lease fees affordable for low- to moderate- income artists, with hopes that the model can be applied to other projects and help provide a growing supply of affordable and secure working spaces.